Matt Hunt: Sincere or Sarcastic? 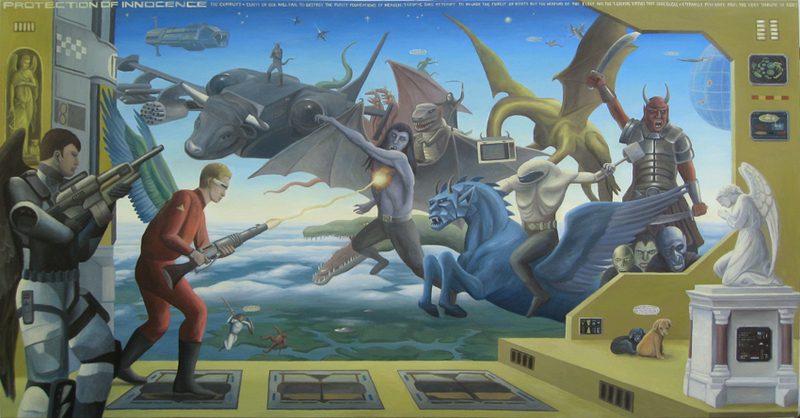 Matt Hunt, 'End of Days', 2010, oil on linen, 160 x 130 cm. Courtesy: Ray Hughes Gallery. Matt Hunt’s paintings have the kitschy-cool charm of covers from sixties sci-fi pulp fiction. A few years ago I wrote, “Hunt’s epic scenes are a heady combo of medieval painter Hieronymus Bosch’s hallucinatory visions, cyber-punk author William Gibson’s tech savvy prescience and the whacked out narrative strategy of cartoons.” And the description still fits… sorta. The works in his 2008 solo show, Universal Apocalypse, did sport more than their fair share of angels and demons, but they also seemed to point the finger firmly at corporate greed for the world’s woes. The symbols of global brands like Shell, McDonalds and Visa are absent from the paintings in Hunt’s current solo show, End of Days. Instead these works seem to be fuelled by equal parts testosterone overload (there are more babes, aliens, guns, guitars and cars than you can poke a stick at) and religious zeal. They appear to channel an obsession with Christian notions of salvation and damnation and it’s not entirely clear if it is real or a dramatic stance, taken for effect. 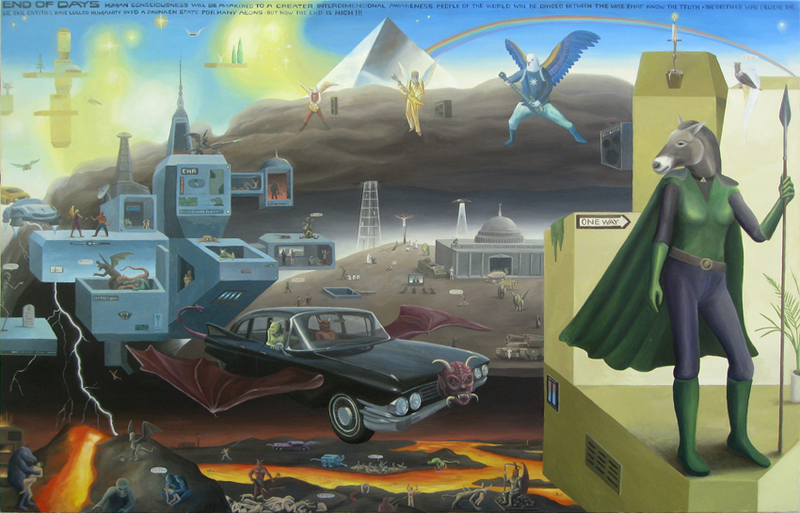 Matt Hunt, 'The Protection of Innocence', 2010, oil on canvas, 130 x 250 cm. Courtesy: Ray Hughes Gallery. In Hunt’s epic canvas, The Protection of Innocence, a space station seems besieged by demonic aliens while two Labrador puppies huddle together. The golden pup’s thought bubble says, “Attention all humans. All you need to do is pray for help & we will be right there for you. The love of the Lord is with U.” Saccharine sweet sincerity or caustic sarcasm? You decide. Matt Hunt: End of Days: The Paintings is on at Ray Hughes Gallery until November 24, 2010.
helo The Post Post , i comment your blog , this a nice blog and useful. Good for me. best review for The Bad and The Good content. i will plan to read and review your website. I think you’ve captured Matt Hunt’s stuff nicely…I like that I feel uncomfortable liking his stuff. I do think his paintings are starting to loose some of their magic with his newer, smoother (more realistic?) style. yeah…I loved them when they were really small and less earnest.